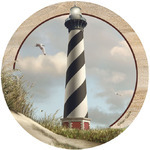 Lighthouse Gifts - Click on an item for more details! This exquisite Stain Glass Lighthouse will bring a unique and artistic addition to your home or office. Notice the bright colors and fine detail! This beautiful piece of art will sure to be enjoyed for a lifetime for all your family and friends. 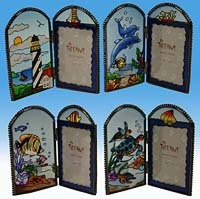 17.5" x 7.5"
This exquisite Dolphins & Lighthouse Stain Glass will bring a unique and artistic addition to your home or office. Notice the brilliant colors and details! This beautiful piece of art will sure to be enjoyed for a lifetime for all your family and friends. 24" x 18"
This exquisite Wooden Lighthouse will bring a unique and artistic addition to your home or office. Notice the hand painted colors and details! This beautiful piece of art will sure to be enjoyed for a lifetime for all your family and friends. *Small lighthouse sold separately 35" x 11"
This exquisite Lighthouse Coat Hanger will bring a unique and artistic addition to your home or office. With hand painted colors and details of life at the ocean, this piece also makes a great gift for the ocean lover in your life. Hand painted wood 14.5" x 70"